Greek police have arrested a Russian man who is believed to have been the operator of the popular BTC-e Bitcoin exchange on charges of laundering more than $4 billion in bitcoin for culprits involved in hacking attacks, tax fraud and drug trafficking. A United States jury indicted 38-year-old Alexander Vinnik on Wednesday after his arrest in Greece on Tuesday at the request of US law enforcement authorities. The suspect is one of the operators of BTC-e, a service operational since 2011. 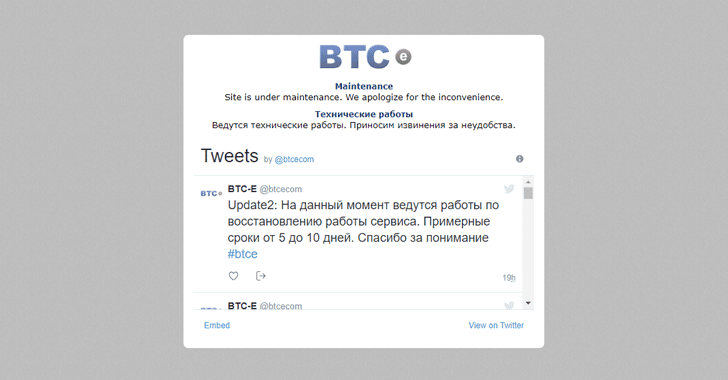 Headquartered in Russia, the digital currency exchange has been offline since the arrest of Vinnik, and its homepage says, "Site is under maintenance. We apologize for the inconvenience.."
According to a press release published by the U.S. Treasury's Financial Crimes Enforcement Network (FinCEN), BTC-e ignored "know your customer" laws in an effort to serve criminals, and even hosted message boards buzzing with illegal activities. The FinCEN also announced a $110 million penalty against BTC-e for facilitating crimes along with a separate $12 Million fine against Vinnik. This case is really important for the law enforcement because it could reveal the possible culprit behind the collapse of the once-very popular Japanese bitcoin exchange Mt. Gox, which was shut down in 2014 following a massive series of mysterious robberies, which totalled at least $375 million in Bitcoin. According to the U.S. Department of Justice, Vinnik obtained funds from the hacker or insider who stole bitcoins from Mt. Gox and sent them to a bitcoin wallet controlled by Vinnik, who intentionally laundered them through BTC-e, over a period of three years. "After the coins entered Vinnik's wallets, most were moved to BTC-e and presumably sold off or laundered (BTC-e money codes were a popular choice). In total some 300,000 BTC ended up on BTC-e," according to WizSec, a Japanese security firm that has long been investigating the Mt. Gox case. "To be clear, this investigation turned up evidence to identify Vinnik not as a hacker/thief but as a money launderer; his arrest news also suggests this is what he is being suspected for. He may have merely bought cheap coins from thieves and offered a laundering service." Vinnik arrest is the latest in a series of US investigations against Russian cybercriminals in Europe, following the shutdown of two of the biggest dark web marketplaces, AlphaBay and Hansa, last week. While Greek police described Vinnik as "an internationally sought ‘mastermind’ of a crime organisation," United States authorities accused him of facilitating crimes including hacking, identity theft, tax refund fraud, public corruption and drug trafficking. Vinnik is to be charged with operation of an unlicensed money service business, conspiracy to commit money laundering, money laundering, and engaging in unlawful monetary transactions. If found guilty, the suspect could face up to 55 years in prison, together with a $500,000 fine or twice the value of the property involved in the transaction for each count.